When will you have a dental emergency? Hard to predict, of course, and your Bonita Springs dentists at Pelican Landing Dental hope you never have one. 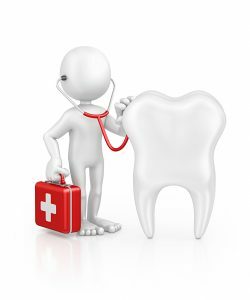 However, if a dental emergency should occur, then having a plan in place is essential. In the case of unstoppable bleeding or a broken jaw, call 9-1-1 or head to the nearest emergency room. Otherwise, contact our office immediately by calling 239-449-6104. A member of our staff will be able to help and schedule a same-day appointment if necessary. Delaying treatment can lead to a worsening condition. Our dentists would much rather determine that you don’t actually have an emergency than miss a serious situation. So please call our office right away if you think you have a dental emergency! How do you know that you have an infected tooth? Unfortunately, the most common sign is excruciating pain. When bacteria reach the interior of a tooth, the inflammation that results can be extraordinarily painful. There may also be tooth sensitivity and facial swelling. In this case, your Bonita Springs emergency dentist will likely need to perform a root canal. This procedure removes the infection, preserves the tooth and prepares the tooth for a dental crown. Left untreated, infection can spread to your gums and even jawbone. Therefore, fast treatment is imperative. While a broken tooth may be painful, this type of injury is often the result of a fall or blow to the face that may also cause discomfort. In this case, take ibuprofen or acetaminophen to alleviate pain and use a cold compress to reduce any swelling. If you have the portion of tooth that is broken, then store this in milk and head to our office. Don’t ignore a sore anywhere inside your mouth or on your lips. Although this is not technically an emergency, it may be a sign of oral cancer. Call Pelican Landing Dental to schedule an appointment so that one of our dentists can give you a diagnosis. Although we hope that we don’t have to see you for a dental emergency, we are here for you and your loved ones. Call Pelican Landing Dental for all of your dental needs.